Sunday was cold, but the sun was out, and the wind was calm. The dog was eager to get outside and play in the snow. My own soul was craving a cold winter’s walk, so we headed to the park for some fun. On our drive to the park, the clouds moved in, and the winds picked up changing the weather conditions. The wind made the single digit temperature feel much colder than the actual thermostat reading. Even though our faces were protected, what little skin was exposed felt the sting of the ice-cold wind. Usually, I like these kinds of days, but I did not want to jeopardize our dog’s feet. So we cut the walk a little short and headed home. As we left the park, we drove by a pond. Our attention was drawn to some activity on the other side of it. There appeared to be about 30 Trumpeter Swans on the edge of the woods. Some were swimming in open water. Others were resting on top of the ice. We decided to park the car and hike over to get a better view. I assumed swans went somewhere warmer in the winter. There has to be a better place to swim than Minneapolis in January. But there they were swimming in the freezing cold. Those resting had their bills tucked under their wings and appeared to be sleeping. Again, I thought, there has to be a better place to sleep. They looked so cold as the wind beat down upon them. Obviously, since they fly, if it really bothered them they could leave. 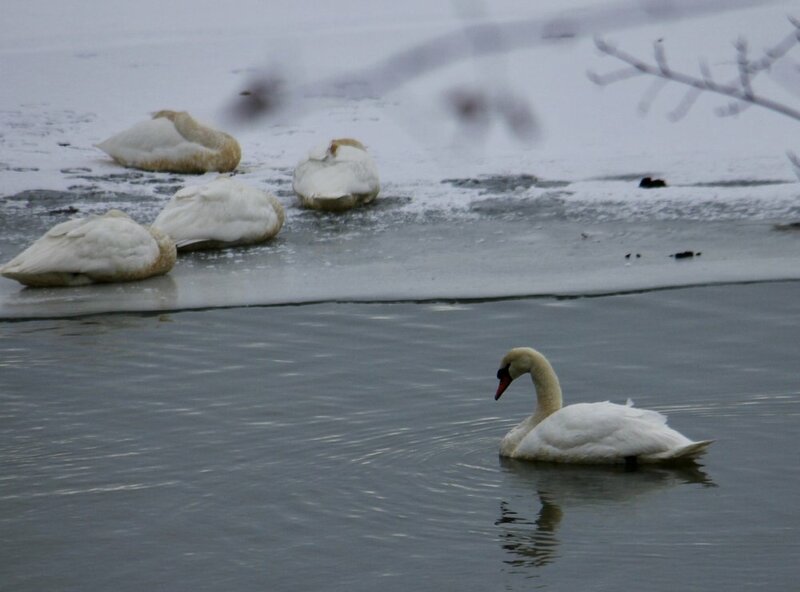 I thought about those swans as a polar vortex dropped down out of Canada into the U.S. this week. They made me think about how the birds and animals handle such brutal cold temperatures. Then I thought about the homeless people in the area, where do they go? How do they cope with this kind of cold? It is sad to admit that my first thoughts were of animals, not people. But then, I wasn’t thinking about either when it was sunny, calm and just frigid. If you are homeless, where you sleep is always an issue. When winter descends upon the northern plains, the options for shelter decrease and the risk radically increases. Elijah sent only to a widow drives home the point of Jesus’ sermon to his hometown friends. He did not come to do miracles, but to rescue the poor and set the prisoners free. If we are not somehow connected to the same type of ministry, Jesus will always remain elusive. It’s not a punishment kind of thing. Just that our gratitude will be shallow and our sense of love fleeting. Caring for the poor typically makes those giving and receiving compassion more grateful. It also helps both feel loved. How well do you handle the cold? What is your most difficult issue when it becomes extremely cold? How can caring for the poor bring depth to our sense of gratitude? When has caring for someone in need brought love to your own heart? Ordinary Voices BlogEric Elkin February 5, 2019 #Beauty, #Creator, #Hope, #Self-Worth, You have been formed by the hands of the Almighty and crafted to find peace in your maker. Ordinary Voices BlogEric Elkin January 29, 2019 #Hope, #Value, #Forgiveness, #PoorDecisions, What God does do is speak the words I need to hear. Mostly, I am loved despite all my messes.